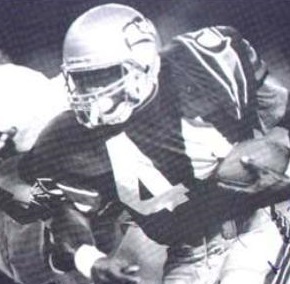 Fenner performed well in college, including an ACC-record 328-yard rushing game against Virginia in 1986. However, there were off-field problems and Fenner was jailed on a murder charge that was eventually dropped, although he received probation for drug possession. It effectively ended his college playing career and Fenner, while cleared to enter the 1989 NFL draft, was avoided until taken by the Seahawks in the tenth round. He saw little action as a rookie, running for just 41 yards and catching three passes, but the departure of RB Curt Warner provided an opening in ‘90. Seahawks went 9-7 to finish third in the AFC West. Fenner had a disappointing year in 1991, rushing for 267 yards while averaging 2.9 yards-per-carry, and departed to the Cincinnati Bengals as a free agent in ’92. As backup to RB Harold Green, he rushed for 500 yards and seven TDs. An upright runner with good power, he was not used much as a pass receiver in his first four seasons but caught a career-high 48 passes for 427 yards in 1993 while running for 482 yards in a limited role. After a similar season in ’94 he was signed by the Raiders to play fullback and Fenner spent three years with them, carrying the ball occasionally and catching passes. Overall, at the end of his career in 1997, he had rushed for 2996 yards on 804 carries (3.7 avg.) and caught 202 passes for another 1578 yards, scoring a total of 42 touchdowns. Of that, 1167 rushing yards and 20 TDs came with the Seahawks.